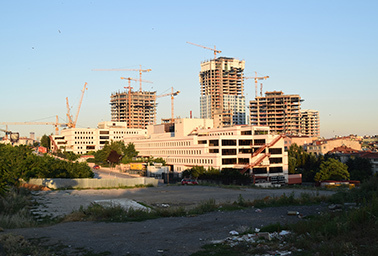 Turkey’s construction boom is fueling skyrocketing emissions, and the government is showing no signs of slowing down. Photo by Atilla Suzer. ISTANBUL -- Driving along the E5 highway, this ancient city's jumble of concrete block high-rises and Ottoman-domed mosques recedes into the distance. The future gleams. Sleek luxury condominiums and shopping malls tower over modern new suburbs. Orange construction cranes have taken up residence along the side of the roads, feeding the teeming city's seemingly endless building boom. Fueling Istanbul's growth -- and, as the country's economic center, Turkey's development, as well -- is coal. With the second-highest energy consumption growth after China, Turkey is highly dependent on Russian and Iranian oil and gas. Even as the country works to take advantage of its location between Europe and Asia to become a regional energy corridor, the government is also banking heavily on coal to power the future. The Turkish government is planning to double its coal power capacity over the next four years, making it the country with the world's third-largest investment in the fossil fuel, according to a Turkish energy consulting group. Plans for 80 new plants will quadruple the number of coal-fired power plants from the 22 currently online. "That is the only natural resource that we have in this country," said Volkan Ediger, a professor at Kadir Has University in Istanbul and a former energy adviser to three Turkish presidents. He noted that Turkey produces just a quarter of the energy it consumes, spending $60 billion per year on imports, a massive chunk of gross domestic product. "This is not sustainable for the next century. The No. 1 priority for the Turkish energy system is independent energy sources," he said. "It's a very important issue for Turkey. It's much more important than any other thing. It's more important than the climate change, than the environment, than anything else." Government leaders appear to feel the same. State figures show that Turkey's emissions grew a shocking 110 percent between 1990 and 2013, the bulk of it from the energy sector -- particularly cement production. Meanwhile, according to researchers at the Climate Action Tracker, Turkey's carbon pollution is expected to increase by 134 percent by 2030. That's hardly consistent with a new global change agreement that will be signed in Paris in December, or calls from wealthy countries to decarbonize the world's energy systems by the century's end. Under the new accord, all countries -- particularly major emerging economies like Turkey -- are expected to announce new curbs on greenhouse gas emissions. With the Group of 20 (G-20) meeting slated for the city of Antalya just ahead of the Paris talks, Turkey will be under pressure to show that it takes its climate responsibilities seriously. But environmental activists say they are not optimistic. "Turkey's government never, ever puts climate change on the agenda. They see climate change as a threat to their political standing and not a threat to the country," said Özgür Gürbüz, the World Wide Fund for Nature's communication chief in Turkey. "They want to build lots of motorways, bridges, mega-projects. Their election campaign promises are all based on fossil fuels. We don't hear climate change, we don't hear public transportation," he said. "Twenty years from now, people will look at Turkey and say, 'What are you going to do now, close all the coal plants you just opened?'" Many activists said that far from figuring out its responsibility in a decarbonizing world, Turkey appears more concerned with pumping out as much coal as it can before regulations are imposed on the country. "This is the Turkish mentality. When we see a yellow light, we speed up instead of slowing down," one Turkish energy researcher joked. Perhaps no place exposes the tension over Turkey's rampant development more than the site of a planned third airport on the outskirts of Istanbul's European side. Slated to become the world's third biggest, the 29 square miles of land has already been cleared of trees. Onur Akgül, an activist with the Northern Forest Defense, which has been fighting the airport, a third bridge over the Bosporus and a motorway that will cut through Istanbul's forested north, describes the barren land as an "open wound" where forests once stood. "They slaughtered the whole forest," he said. 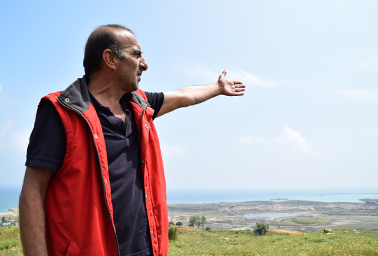 A villager outside Yeniköy points to open-pit coal mines that are being filled in as part of the construction of a third airport outside Istanbul that environmentalists say is exacerbating Turkey's climate contribution. Photo by Lisa Friedman. Some villagers agree. Hayri Koyuncu, 53, points to a vast expanse of grassland around the town of Yeniköy that will soon be airport. His family has been in the Black Sea region since 1924, for decades working in animal husbandry and farming. "In these days, the beans and vegetables that were flooding the market for Istanbul were produced here. We had cows, animals, we were very happy. This village took care of itself," Koyuncu said. "My opinion is, if the airport is constructed, the freedom of the village people will be ended. Because for someone to be free, he has to survive with the natural resources." On the other hand, Handi Akyuz, an Istanbul taxi driver, said he wants to see even more mega-projects. "It's not enough. Even a third bridge is not enough. We need four bridges, five," Akyuz said, navigating Istanbul's notorious congestion. Ozcan Omural, head of business development for the Mapa Construction and Trade Company Inc., one of the five companies involved in building the airport, said Turkey deserves the same prosperity Western countries have achieved by cutting forests and building coal plants. Like many Turks, he found the global environmental criticism facing Turkey just as its economy is taking off suspicious. "Turkey is a developing country, and of course it needs infrastructure. The city has to grow somewhere, and you have to build new places," he said. "In my opinion, I believe they bring those rules to control the developing countries' industrialization." In the international climate negotiations, Turkey plays a unique and sometimes isolated role. When the Kyoto Protocol was established in 1997, creating two categories of countries -- industrialized or "Annex A" nations expected to take mandatory emissions cuts and developing "non-Annex A" countries off the hook entirely -- Turkey somehow found itself in both groups. Turkish officials maintain it was simply a clerical error. Others say it happened because the country's negotiators were poorly prepared and assumed it was in Turkey's best interest to be linked to wealthy nations. As soon as leaders realized the implications of the decision, they tried to back out. 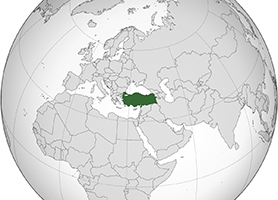 For the next several years, Turkey had a single-minded focus: getting out of Annex A. It succeeded in 2001 and was granted a "special circumstance." In the years since, analysts say, the country has laid low. 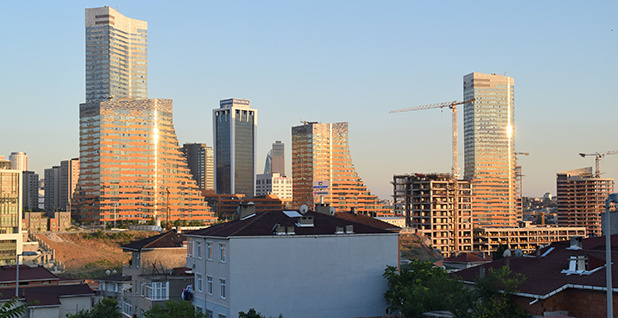 New housing, shopping malls and office towers are a common sight around Istanbul, where the construction craze has helped boost Turkey’s gross domestic product 230 percent since 1990. Photo by Atilla Suzer. The government rarely offers ideas for tackling difficult issues in the talks -- its most recent submission was in 2013 -- and its delegation is usually among the first to fly home from negotiating sessions. At the most recent talks in Lima, Peru, last year, the only notable intervention Turkey made was when its chief negotiator threatened a veto if talks went past 5 p.m.
"Let's keep our heads down, and maybe no one will notice us. That's been our position, I feel," said Mahir Ilgaz of 350.org, an environmental group. Several efforts to interview members of Turkey's negotiating team were unsuccessful. Liz Gallagher, who leads the climate diplomacy project at E3G, a U.K.-based advocacy group, said Turkey doesn't align itself with the hard-liners in the U.N. talks or the progressive nations or even regional neighbors. "In the climate negotiations, it's quite difficult to box them in. They're sort of on their own," she said. "In some ways, it's turning into Russia, becoming more obstinate. On a geopolitical level, it doesn't much care what the rest of the world thinks about it." But, Gallagher said, "they are going to be forced into the spotlight at the G-20, and they are going to be forced to talk about climate change, and they don't have anything to say, frankly." There is a way, but is there a will? Yet it's not as if Turkey has done zilch on the clean energy front. In 2010, the government implemented a renewable energy law aimed at increasing the share of clean energy to 30 percent by 2023, incentivized by feed-in tariff rates. A separate energy strategy blueprint set out goals to reduce primary energy intensity by 20 percent in 2023 compared with 2008. Environmentalists grouse that renewables already represent 29 percent of the mix, making the target negligible. They also maintain the government limited licenses for solar and wind while giving legal and financial incentives to coal. But Adonai Herrera-Martinez, working with the European Bank for Reconstruction and Development in Turkey, said the government has been eager to work with a sustainable energy initiative that develops credit lines to support small energy companies and energy efficiency projects. And Tanay Sidki Uyar, president of Eurosolar Turkey, says he is certain the country can go to 100 percent renewables by 2023. "Turkey can go to 100 percent renewable energy a little bit earlier than California. This is possible. Renewable technologies have grown and are competing when compared with fossil fuels," Uyar said. 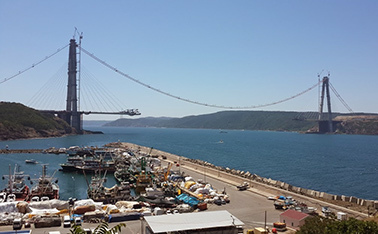 Construction of a third bridge across the Bosporus has sparked controversy in Turkey. "Even a third bridge is not enough. We need four bridges, five," said one taxi driver. Environmentalists disagree and argue that such mega-projects fuel more pollution. Photo courtesy of Wikipedia. But getting there is going to depend on what policies the government implements in the coming years, as well as its target for Paris. Environmentalists, for their part, wanted to see Turkey set a year by which its emissions will peak, but those hopes were flatly dashed when the government released a Paris target of only cutting emissions "up to" 21 percent from business-as-usual levels by 2030. Activists quickly calculated that this will lead to Turkey's emissions reaching 11 tons -- rising as much as 116 percent -- by 2030. Gürbüz tweeted that the contribution "offers nothing." Gürkan Kumbaroglu, incoming president of the International Association for Energy Economics who has been leading the modeling for the Turkish government's Paris pledge, said he still hopes Turkey can be part of a global solution to climate change. But, he said, it must change its embrace of coal and remove hurdles for clean power for that to happen. "Turkey's renewable energy potential is much larger than European countries. From energy efficiency to wind to solar, there's much potential to exploit in Turkey," he said. "But right now, if you want to put solar panels on your roof, it's a huge bureaucratic hassle. You have to get a license like you're making a second floor of your house. "By 2025, I would like energy intensity growth to change radically, to come down to levels comparable with European countries. And by 2025, a large portion of renewables should be specified by a carbon price," he said. "If Turkey goes the sustainable development path, this could set an example to other Middle Eastern countries." WWF's Gürbüz said activists need to fight the narrative popular in Turkey that it is being asked to take on an unfair burden. "I think it's a deliberate misunderstanding, actually," he said. "We don't want Turkey to save the world. We want every single country to do whatever they can do. If you want to clean the street, you must sweep the floor of your own house."